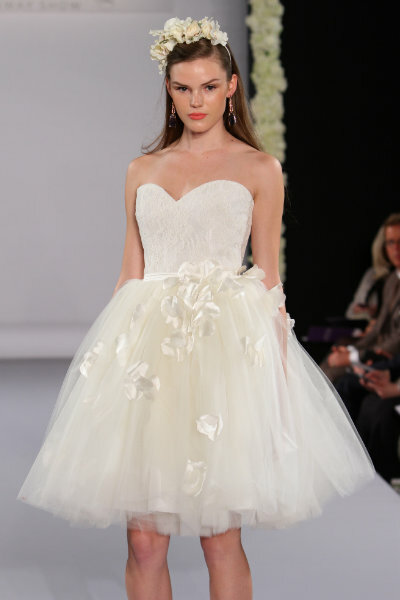 Ladies in the know adore a short wedding dress. There is something irresistibly sweet yet seductive about short bridal gowns that is highly appealing to the modern bride. With such a wide range of locations and infinite styles of wedding, brides have a wider range of what to wear. Most will say ‘no, thank you’ to an overpowering meringue or formal, flowing gown if they are getting hitched on a yacht, popping to an art deco registry office, tying the knot in Tahiti, or leaving the church on a motorbike. Short wedding dresses are the province of the young, lithe and spirited. That does not mean you have to be 18, but you’ll need a good pair of legs and an attitude to match. In a cute little white or ivory number like then you can feel fresh, modern and model-like if you have the figure for a daringly mini Modern Trousseau number, or sweet and thoroughly vintage like in this lovely Inspiration Bridal number. You can go brilliantly white and futuristic in a piece of art by Junko Yoshioka or go satin and tutu gaga with Amsale’s Tia. If you are a true fashionista, you won’t go far wrong with asymmetric Anne Bowen and even though the dress is short, you can still live out the fairytale with floaty Marchesa. The short wedding dress style suits light designs but must be flawlessly executed – there is simply not enough material here for mediocrity. Accessorise with a sweet little fascinator, a few feathers or diamante hair pieces on top, along with the prettiest, most chic and perfectly matching shoes you can find, whether you want designer heels or the daintiest ballet pumps. Speaking of the latter, now that Keira Knightley has gone and got wed in a short wedding dress, we can truly say that this trend is the height of ‘now’ and has never been more perfect for fashion-conscious brides.